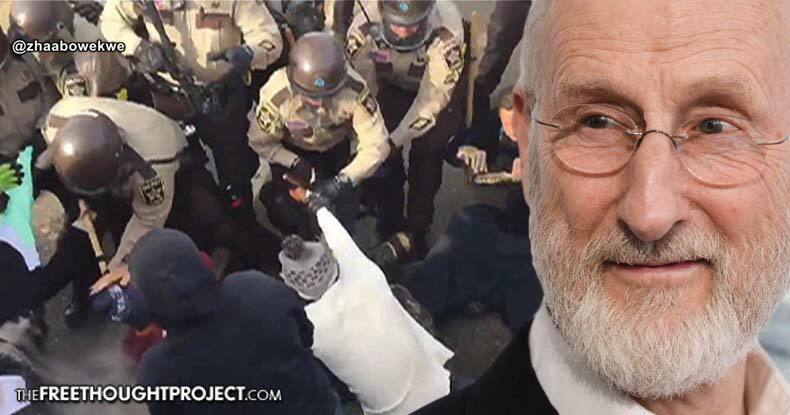 Cannon Ball, ND — Award-winning actor and longtime environmental and animal rights activist, James Cromwell, held nothing back in an interview Sunday, when discussing ongoing exploitation and brutalization of Indigenous peoples battling Energy Transfer Partners’ construction of the Dakota Access Pipeline. To Cromwell, like innumerable observers, that the government would lash out violently against Standing Rock Sioux water protectors and their supporters to defend the construction of a pipeline for Big Oil profit evinces systemic racism and oppression practiced since the first Europeans arrived in these lands. Months of a veritable blackout by mainstream media, he contends, shows the appalling complicity of reporters obligated to deliver a narrative acceptable to corporate backers. In a typical protest, Cromwell told The Young Turks’ Jordan Chariton, “for the most part, the police arrest people, but they behave very rationally. When they come to the Indigenous community, they behave like thugs. And that shows the racism that sort of underpins the entire thing. To wit, Cromwell gave the interview from the Oceti Sakowin Camp, the largest of several encampments near the Lake Oahe reservoir on the Missouri River erected to peacefully block Dakota Access construction, and one of two which the U.S. Army Corps of Engineers intends to evict as of December 5. Led by the Morton County Sheriff’s Department, unnecessarily-militarized law enforcement from at least nine states have unleashed the full fury of the Police State against the unarmed water protectors in a pattern of escalation and brute force. Tear gas, rubber bullets, Tasers, bean bag projectiles, concussion grenades, sound cannons, and weaponized water, have left hundreds injured, traumatized, and even maimed. Vanessa Dundon, a Native American water protector better known as Sioux Z, faces permanent vision loss in one eye after police launched a tear gas canister at her head, severing her retina, during the most explicitly barbarous crackdown on water protectors on November 20 on Highway 1806’s Backwater Bridge. Lacking health insurance, Sioux Z — who has acted as security and a first responder during such police offensives — has been forced to rely on crowdfunding for surgery necessary to save her sight. A non-Native supporter of the water protectors, Sophia Wilansky, had her arm blown to shreds by what might have been a Stinger grenade during the same skirmish as she delivered water to 400 people trapped on the bridge. Surgeons are still trying to save her arm and avoid the possibility of amputation — a medical effort also being partially funded with donations. Eyewitnesses say both women appeared to have been intentionally targeted by police — an allegation reinforced by medics and first responders from the Standing Rock Sioux Reservation and the City of Bismarck, who observed the riot-cop army aiming for water protectors’ heads and legs. As many as 300 people suffered various injuries during the over six-hour attack by law enforcement. One tribal elder twice went into cardiac arrest amid the fog of tear gas, hail of rubber bullets, and — most astonishingly dangerous and appalling of all — a near-constant soaking by icy water in sub-freezing temperatures, à la 1960s police use of fire hoses against black civil rights protestors. Cromwell’s distinction between the Standing Rock Sioux’ fight to preserve clean water and typical anti-fossil fuel protests isn’t an arbitrary one — and he would know from firsthand experience. In December 2015, Cromwell and others were arrested for disorderly conduct after attempting to block the entrance to a Competitive Power Ventures power plant. A second arrest came in June 2016 for blockading the entrance to the Crestwood Compressor Station — part of an expansion of fracked-energy infrastructure greenlighted by the Federal Energy Regulatory Commission and ignored by New York Governor Andrew Cuomo, despite vociferous condemnation by local residents. Similar to actions at Standing Rock, both incidents involved physically obstructing the commerce of Big Oil — but, quite unlike police defense of the Dakota Access Pipeline, Cromwell, and the other arrestees weren’t physically brutalized or treated as enemies of the State. That striking contrast is additionally evidenced in mainstream media coverage — or astonishing lack thereof. As TYT’s Chariton notes, corporate media arrives instantaneously at the scene when protests, rioting, or violence occurs following a police killing — such as with Ferguson and Baltimore — but in the case of Standing Rock, because the peaceful battle is against Big Oil, there has been a dearth of coverage by the mainstream press. Controversy about the Dakota Access Pipeline has been a prime example of this, as corporate presstitutes continue pushing the official police accounts of violent incidents via Morton County Sheriff Kyle Kirchmeier — whose laughably-thin explanations for officer use-of-force have been wholly invalidated by independent and alternative media outlets time and time again. In fact, independent journalists on the scene in Standing Rock have collected physical evidence of and filmed law enforcement engaged in the exact activities Kirchmeier denies. Inaccurate or utter lack of reporting on the Standing Rock Sioux Tribe’s efforts to end pipeline construction have been the nail in the coffin for many already weary from horrendous mainstream coverage of the 2016 presidential election cycle. Online alternative media — which has been a font of thorough and accurate information for both issues — presents quite the tenable option for those seeking non-corporate, non-establishment-biased journalism.